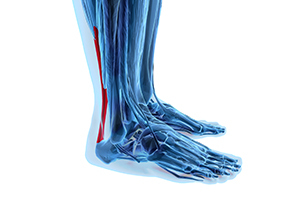 The Achilles tendon is one of the largest and strongest tendons in the body. It can withstand a large amount of force, but in some situations these forces can be too great and a condition called tendinopathy results. Achilles tendinopathy is the inflammation of the Achilles tendon, and it's very common in athletes, especially elite runners. Patients with Achilles tendinopathy are typically treated with a specific type of exercise program called eccentric training (ECC), but there's no convincing evidence that this is the most effective treatment for this condition. Based on this, a powerful study called a randomized-controlled trial (RCT) was conducted that compared ECC with another program called heavy slow resistance training (HSR). Recreational athletes with Achilles tendinopathy were recruited, and 58 were accepted and randomly assigned to either the ECC or the HSR group. Both programs lasted 12 weeks are were led by a physical therapist, who provided detailed instructions on how to perform the exercises. The ECC program consisted of three sets of 15 slow repetitions of exercises performed while standing on the step of a staircase. One exercise was performed with knees straight, the other with knees bent, and they were done twice a day, seven days a week. The HSR program was performed three times a week and had patients use resistance equipment to perform three two-legged exercises, for 3-4 sets. All patients completed a questionnaire that assessed their symptoms, function and pain before and after the intervention, and then again one year later. Patients in both groups experienced improvements in both the short and long term. This was particularly seen in physical activity and pain levels during sporting activities, as similar improvements were found in both groups. The only detectable difference identified was in patients' satisfaction with treatment: the HSR group was more satisfied with treatment than the ECC group after the intervention and one year later. Nonetheless, this RCT suggests that these exercise programs are effective for Achilles tendinopathy patients for up to one year, and physicians should consider both ECC and HSR to be viable options for treating these patients.